Market CommentThe Greece debt problem is pretty much driving FX markets over the last few last sessions. This morning there is news that a Greek aid package will not be finalized by Euro Zone finance ministers until Tuesday 16th of February. That means the recent focus and volatility around Central Bank and Finance Ministers speak will continue for a few more sessions likely. Keep your eye on the news wires and these strong moves can come any time. We expect an aid package announcement would be bullish for the Euro as this Greece story has really been one of the major factors in the Euro sell off. We also note that UK is large holder of Greece debt, so an aid package could also benefit the GBP. However the Bank of England inflation report out yesterday was more dovish than anticipated and could be a short term negative for the GBP. Strong jobs report out of Australia overnight and it opens for further rate hikes by RBA, which should support AUD going forward, buy on dips we reckon. Maybe more attractive to buy AUD vs. other currencies than USD, maybe JPY is the debt problems in Greece gets dissolved. We still see JPY as overvalued. JPY trading strongly on risk aversion, we don’t think the JPY will do well over time as fundamental weakness should catch up with valuation. We think JPY is hugely overvalued at this point. Good rally in S&P futures towards 1072.50 high, but making a lower intraday high than previous day, but a higher lower (an inside day in technical analysis terms). The strength from Friday is still in the background with daily record volume this year and the highest volume day seen since 21st of November2008. The bar closed way off the lows as prices reversed strongly towards the end of the session. This certainly signals that is was a lot of buying in that bar, otherwise it was no way it could have rallied that strongly off the lows. We would like to see a daily close above 1080 to really confirm this bullish signal. Key support is now Friday’s low (1040.75) and the 23,60% Fibonacci retracement of the March 09 to January 2010 coming in at 1031. Key resistance remains 1103. Gold is once again above the 1075 key level and could rally towards 1094 as long as this 1075 to 1070 level holds. Crude is on the offensive again and above 75 USD per barrel level, but as we have mentioned many times of the previous weeks, it remains in the wider range since 6 months and it doesn’t appear to be any real driver near term to take out this range with support at 67.87 and resistance at 84.33. We note that CAD is getting a bid on the latest rally in Crude and maybe worth looking at buying some CAD? VIX hit our target of 26 Friday and we think it is limited how much higher it will go near term, but again depends on S&P ability to stay above 1056 key support, actually yesterday’s low. EURJPY vs. S&P 500 futures, ssee how the correlation has been totally off the last few months, but returned last week or so. 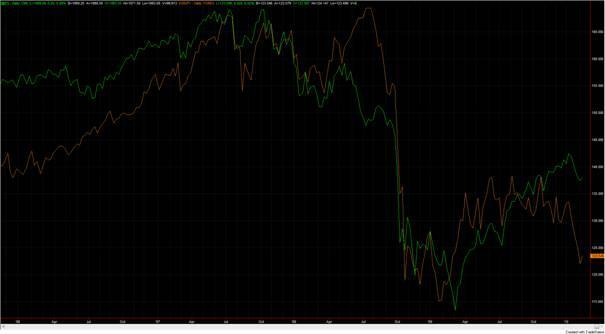 Looking at the EURJPY vs. S&P 500 chart is looks like every time there has been a longer time of very low correlation it has been followed by a longer directional move. Euro: Weak below 1.3840 and the next Fibonacci level, 61.80% retracement is at 1.3488. Looks like sell on rallies until the stock market get some upside momentum. Cable: Break below 1.57 key support took the pair out the range that it traded for over the last 6 months, which is very bearish and opens for a move towards 1.5370 level. A break above 1.58 would make a reversal pattern and signal a potential bottom. USDJPY: The 88.58 low from 4th of February has held so far and we favor longs as long as this level holds. Falling resistance from April 09 high is coming in at 92.55, which needs to be taken out to open for any stronger move higher. We still favor getting long when the current debt crisis nerves diminish, but that could take a few days. Longer term we still expect JPY to underperform due to high public debt, weak demographics and tougher export markets due to slower growth going forward. AUDUSD: Big spike on the better than expected Australian jobs report overnight and it now looks like a solid base have been built around the 0.8579 low from 5th of February. Next resistance level is 0.8916 (3rd Feb high). USDCAD: The 1.0750 has held again and back below 1.06 this morning, now expect it to move down towards 1.04 support that has been a swing level numerous times the last months. EURJPY: Break below 124 is basically enforcing the recent bearish momentum it has now broken out of the range seen since April 09 and next really strong support level is now 115.90. A daily close above 124.20 would open for a run higher. GBPJPY : Weak below 141.43, which is 5th of February high and need to see a close above this level to make a bullish pattern or daily chart. Key support remains 138.26 (5th of Feb low). AUDJPY: Key support at 76.30 has held so far and the spike overnight on the better than expected Australian jobs report signals a potential bottom has been created. We would like to see a close above 80.32 as confirmation of this bottom.